You Have to Try These BBQ Recipes ! When the weather heats up, it’s time to head outdoors for dinner. Cooking outside on the barbecue or grill is a great way to take advantage of the warm weather, fresh air and relaxed feelings that come with summer. Plus, it’s easy to make delicious and nutritious meals without turning on the oven and breaking a sweat inside. Barbecue recipes, while generally pretty simple, involve complex flavours featuring sweet, savoury, spicy and tangy elements, and they work with meat, fish and vegetarian offerings. If you’re stumped what to make this year, here are a few fantastic BBQ recipes you have to try. Your friends and family will thank you. Veggie burgers from scratch take some time to make. Unfortunately, most frozen, ready-to-go patties lack flavour, texture or both. Here is a fantastic vegetarian, vegan and celiac-friendly veggie burger recipe that will have even the meat eaters asking for seconds. It does take a while to put together, but they can be made in advance and frozen for future use. The recipe, by Emma Christensen of The Kitchn, makes six servings and uses beets, black beans, brown rice and rolled oats to make these exceptional burgers. Almost every backyard barbecue includes the same old staples: burgers, barbecue chicken and grilled corn. 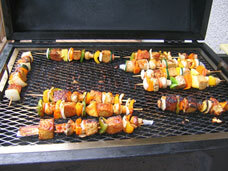 But your grill party can have more adventurous recipes your friends and family will talk about for weeks. Try these marinated and grilled lamb kebabs from Food and Wine and discover the rich, slightly spicy flavour of grilled lamb, roasted tomatoes and Middle Eastern spices. The bite size pieces will be a hit with kids and adults alike, and there are guaranteed to be no leftovers. Serves six. It’s equal parts impressive, unexpected and delicious. 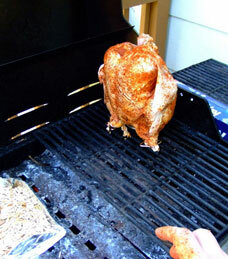 Beer can chicken is exactly what it sounds like, chicken that’s grilled with beer. The can of suds is placed inside the chicken cavity and used as a stand, helping keep the insides moist and flavouring the chicken as it cooks over the coals. Marinating the chicken first or using a rub lends an additional layer of taste. Ultimately, this dish is scrumptious, but it’s also just a lot of fun. If you’ve never had it, this summer is the one to try beer can chicken. Great either as a man dish or an appetizer, bacon wrapped barbecue shrimp have all the elements of a successful cookout, especially the bacon, plus it’s a snap to make. The only hard work is peeling and deveining the shrimp, which you can have the fishmonger do for you at your local seafood vendor if you’re not familiar with the process. It’s also highly customizable, relying on your favourite BBQ rub or combination of spices to create the sweet and spicy taste beneath the bacon. Try this simple recipe next time you’re craving freshly grilled seafood. Appetizers and entrees aren’t the only meals you can make on the grill; dessert is also better when it features a few tantalizing grill marks. Fruit tastes even sweeter when it’s grilled since the sugars in the produce caramelize in the heat. Grilling some fresh pineapple and pound cake elevates a typical and delicious dessert into something truly impressive and out-of-this-world delicious. Add in a homemade rum-caramel sauce, and you have a final temptation that no one will turn down. Check out the recipe and make your next BBQ the best ever. 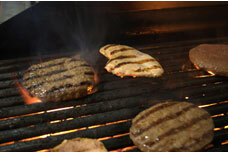 We want to help you light up the night so your BBQ can run into the wee hours. Give us a call today to learn how our solutions are both beautiful and functional.